When I grabbed the side tables at Ikea to eventually make THESE trunk cube tables, I knew I’d need some items to style the tables with so I picked up some succulents. I have been a fan of succulents for a few years now, I love the vibrant green colors and how low maintenance they are. I love putting fresh flowers in our room, my office and sometimes the living room but as we’ve begun transforming the living room, it’s taken a masculine turn (which I love) and I thought these succulents would be a better fit. I wasn’t sure what I wanted to put the succulents in and the plastic pots they came in were awful so I thought a terrarium would be a really cool focal point for the room. This took us about 20 minutes to make… it was a fun thing for us both to do and it looks great on the new tables! Start of with a glass container to build your terrarium in (1). The key here is it needs to be tall enough to build your layers and slightly domed at the top so the moisture doesn’t escape too quickly. We got this one at Joann Fabrics on clearance. Pour in a couple inches tall layer of small pebbles (2). We got ours at Lowe’s because we loved the different colors, but you can use any small stone. The idea here is that the water can drain through the soil and sit in the rocks so that the soil isn’t too damp. Next, pour in a couple inches tall layer of cactus soil. We got our succulents from Ikea but they have them at the home improvement stores or you can get them at a gardening center. Take them out of their pots, carefully loosening up the soil around the roots and gently settle them into the soil (4). Play around until you get them in the spots you want them (5) and make sure the soil is right up under them. Next, add a layer of sand (6)… we got ours from the beach but you can get huge bags of play sand at home improvement stores or small bags of vase filler at craft stores. 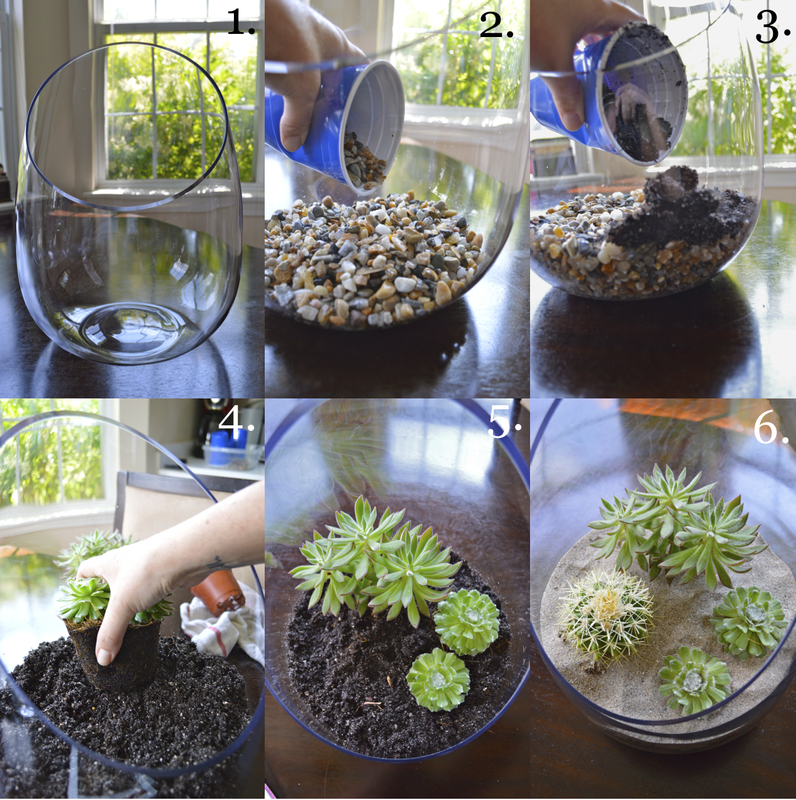 Use a straw to blow any excess sand off the succulents. 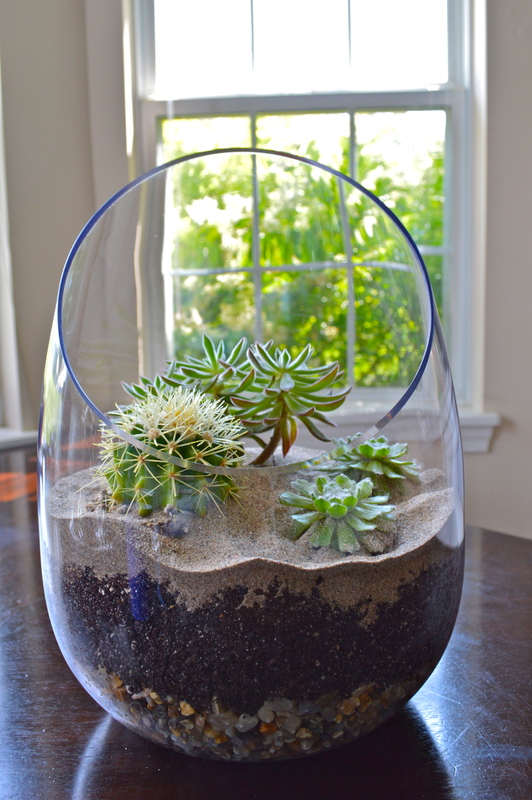 Water the terrarium with just enough water to moisten the sand, then wait two weeks before watering again. Set the terrarium in direct sunlight for a few hours each day. Love succulents. I love making terrariums. Your project turned out wonderfully! Using beach sand is a mistake since it contains salt that can kill roots. Better to buy builder’s sand at a DIY store like Home Depot or Lowe’s. Our sand came from a beach that’s on a fresh water lake so it was not a mistake! Thanks, Ally! Did you use the same rocks as me for yours? Because they’re so small there’s not a lot of gaps in between so I found that helpful in keeping the layers neat! Bello, I love suculents and I have lots of them in my garden, I`m afraid of making terrariums due to not having any drain holes!!!! I don`t want my plants die.